The first thing you notice about Mike Abell isn’t that he’s blind. You take in his height and his manner of dress. He’s a tall cowboy from the tip of his ten-gallon hat to the bottom of his crocodile boots, and he has a nickname to match: ”Big Dog.” You recognize that he has a joviality as wide as the open prairies. It’s only later that might you wonder why he’s wearing black sunglasses inside – that is, if you haven’t already noticed how his fingertips brush the walls and surfaces of the rooms he navigates. Michael “Big Dog” Abell, who received his master’s in Professional Counseling from GCU, recently launched a support group for the visually impaired. 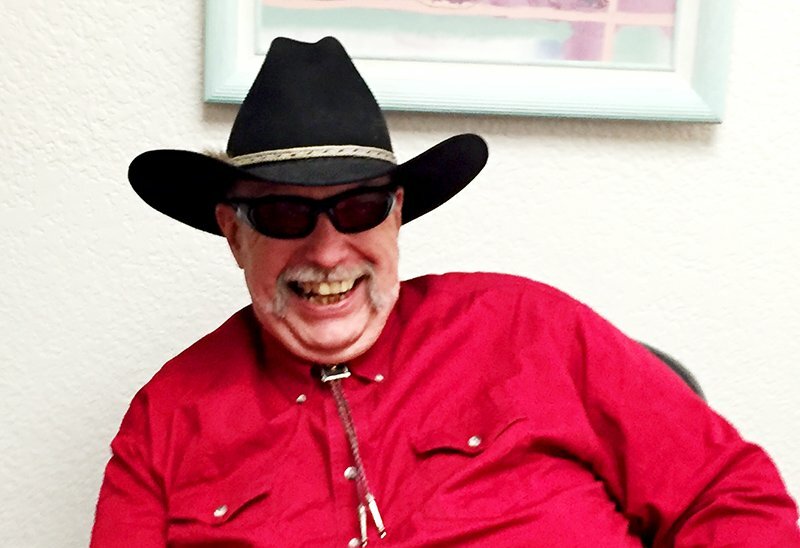 Abell, who just finished a master’s in Professional Counseling from Grand Canyon University, began losing his vision after a firecracker accident in 1968 and lost it completely in 2003. It’s also something that makes him especially able to counsel visually impaired clients at Family Ministry Counseling and Psychotherapy Services at 700 E. Jefferson St., Phoenix. In January, he launched a support group for the visually impaired, called “Visionaries,” that has the slogan, “Helping individuals to find their eyes in the dark.” It has grown from two to eight members since then. “God has been involved from the beginning,” Abell said. God led Abell to GCU more than once, he said, and the University led him to his purpose: providing counseling to others without sight. This fall, Abell plans to return to pursue his Ph.D. in counseling with the goal of eventually teaching at GCU. The firecracker accident that took the sight from his right eye when he was 9 didn’t stop Abell from earning a bachelor’s degree in sociology and religion from GCU in 1988. It also didn’t stop him from becoming an ordained Southern Baptist minister or keep him from marrying his wife of 35 years. But the slow disintegration of his remaining vision over the course of more than three decades, despite numerous surgeries, did slow him down for a stretch. During that time, Abell found himself sitting at home in the dark day after day listening to his favorite show, “The Price is Right.” One day, a power outage forced him out of the house with his cane – and eventually sparked his decision to enroll at GCU for his master’s degree. He wobbled to Walgreens to use the phone that day only to realize he couldn’t find his way back home. When he finally returned, he said he promised God that once he got the electricity turned on, he would go through the Vocational Rehabilitation program offered by the Arizona Department of Economic Security. A few months later, in January 2014, he had a computer, speech software and admittance to GCU for his master’s degree. It wasn’t long before Abell, his wife and children moved into a new house in downtown Phoenix. In January 2016, when Abell was searching for a counseling internship as part of his degree program, he turned to God. Abell was interested in Christian counseling as well as narrative therapy, a method that separates the person from the problem, offering a new perspective that allows them to rewrite their stories. “Dr. Thomas Lewis was the first name that cropped up,” Abell said. So he contacted him. Lewis, who practices at Family Ministry Counseling and Psychotherapy Services just down the street from Abell’s new house, admitted that he dodged Abell’s request for an interview at first because he wasn’t sure about the idea. “One day I came to work and he was outside my hall, all jovial and everything,” said Lewis, who had just moved to Phoenix from Colorado and who also has an interesting nickname, ”Too Tall,” and stands about 6-foot-9. Lewis couldn’t help but offer him an internship, and Abell enthusiastically accepted. The next day, Lewis said, he took a call from a visually impaired man and realized how much Abell could be of service. Most people with visual impairment don’t receive counseling, and many expend a lot of energy just coping and getting through everyday life. One goal of the “Visionaries” support group is presenting the opportunity to use grieving to help process the loss of sight, he said. Other topics the group addresses include intimacy, relationships and dignity. Dignity, he said, means something different for everyone. Abell has been asked to speak about intimacy in November at VRATE 2017 (Vision Rehabilitation & Assistive Technology Expo), to be held in Glendale. He is also highly regarded by GCU employees such as Beth Jamison, Disability Services Manager of Academic Compliance and Regulation, and Dr. Nóe Vargas, Assistant Dean of the College of Humanities and Social Sciences. Vargas said, “Michael has a very uplifting and hopeful outlook at life. … He feels he has been called to serve others by providing counseling services, in particular to those suffering from visual impairment. Abell has an equal regard for GCU professors, staff and students.